announced the US Department of Defense [Pentagon] on Thursday , a US military killed Thursday in a bomb blast in northern Iraq. did not say the Pentagon statement the dead soldier or the incident site name. It was the fourth soldier killed by army US combat operations in Iraq since its launch against Daesh 2014.
this information comes on the fourth day of the launch of the joint Iraqi forces with the support of Air coalition forces in military operations to liberate Mosul from the control Daesh. THE WORLD 10/20/2016 20:15 (Updated 20:17 20/10/2016) Copy the link 0 3 0 0 United Nations called on Thursday to protect Iraqi civilians in Mosul, which is witnessing a military operation to liberate it from the grip of the “Daesh” terrorist, noting that the Iraqi government and the Iraqi Kurdistan authorities confirmed secured. Cairo – Sputnik High Commissioner of the United Nations Commissioner for Refugees, Filippo Grandi, said during a news conference in Cairo today: “It’s important to get civilian in Mosul, the necessary and the Iraqi government and the authorities of Iraqi Kurdistan, stressed the protection secured.” He stated that 900 people were civilians, “left the realms of Mosul to Syria and they are now in Hasaka region, there are a left Mosul toward the south.” He added: “In Syria, the United Nations is helping these 900 people and then rushed displaced Syrians from the region to us for assistance, and this shows the widespread frustration among citizens.” Mention, that the Iraqi prime minister, Haidar al-Abbadi, the night of 16 announced on October / October 17 the military operation to liberate Mosul starting from the grip of the “Daesh”, which captured the city in June 2014. The various parties and international organizations have expressed their concerns about the situation of civilians in the city. The Governing Council of Representatives, on Saturday for its regular reading of the vote and a number of draft laws. The agenda of the meeting includes ‘vote on the proposed amendment of Article [49 / I] of the Constitution of the Republic of Iraq in 2005 [submitted by MP Hamid vegetation]’. The parliament postponed a vote on the proposal but vegetative said, that ‘ thePresidency of the Council of Representatives has vowed to include the proposal that reducing the number of council members in the Saturday session agenda’. It also includes the agenda ‘vote on the draft imports Municipalities Act, voting in principle to a proposal of the Fourth Amendment to the law Journalists Syndicate No. 178 of 1969, and vote on the wording of a decision on taking the necessary measures from the government to release the abducted Alaesideat and reconstruction of Sinjar and position of the genocide of Yazidis them ‘. It will ‘vote on the formation of a committee Mstrkhbouksos the subject of media reports accusing some senior Oil Ministry officials of corruption and vote on thedraft abandon acquired citizenship law’ on the agenda. This includes the parliament session agenda next Saturday ‘ an oral question to the Minister of Construction and Housing and municipalities [MP Huda Sajjad,the first reading of the draft amendment law of the first to the Amnesty Law No. 27 of 20.10.2016 the first reading of the proposed cancellation of theRevolutionary Command Council Resolution Act [dissolved] No. 180 of 1977,and the first reading of the proposed law of the Federation of Iraqi parliamentarians’. Also scheduled to parliament reads ‘enterprise Agency Regulatory Act first asreading, with the introduction of a general topic for discussion regarding thefollow – up to water and electricity file’. WASHINGTON The US partnership with Turkey in countering Islamic State is “very strong,” US Defense Secretary Ash Carter said at a news conference on Thursday. “With respect to Turkey, our partnership is very strong in the counter-ISIL campaign,” Carter said, using an acronym for Islamic State. Carter made the comments after Turkish air strikes pounded a group of Kurdish fighters allied to a US-backed militia in northern Syria overnight, highlighting the conflicting agendas of NATO members Ankara and Washington in an increasingly complex battlefield. 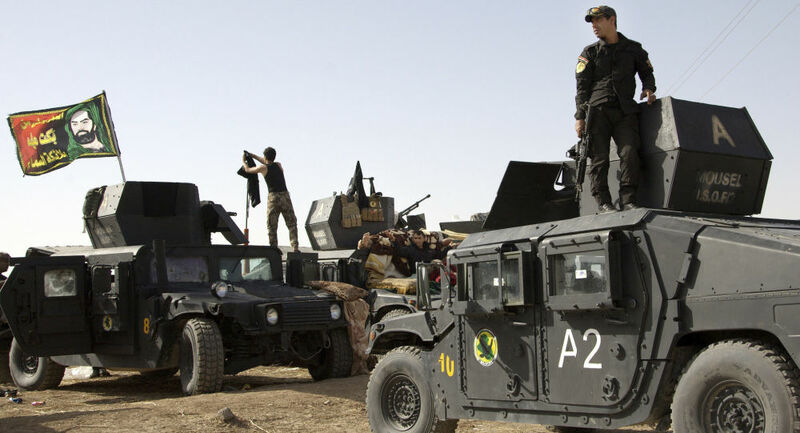 Twilight News / media sources reported that the Kurdish Peshmerga forces regained control of the nine villages of al Daesh on Thursday to continue its progress in the military campaign that began at dawn on Monday and aims to grab the connector from the militant group. The sources said in the news pursued Twilight News that US Apache helicopters participated in combat is in support of the Peshmerga forces have launched raids on Daesh sites. This is the first time you talk about the participation of the American Almrahiat fighter in the war against Daesh. The commander of US forces in Iraq, Gen. Gary Wolski had announced on Wednesday, he said he does not rule out the participation of the US Apache helicopters in Mosul editing process. Kurdish sources said that the Peshmerga forces retook the fourth day of the campaign nine villages in the west and north and south-east city of Mosul contributed US Apache helicopters strike by supporting terrorists’ positions with aerial bombardment center. International Monetary Fund cut yesterday its previous forecast for the level of the budgets of the GCC deficit over the next six years, a trillion dollars to 765 billion, having taken austerity measures is unprecedented, including thereduction of benefits and rewards for government employees, and to reduce energy subsidies and the imposition of new taxes, in order to cope with the prices declining oil. Fund predicted that the imposition of taxes in the region and the partial improvement in oil prices, the rise in non – oil growth in the Gulf countries to 5.3 percent, which is much lower than the average period between 2000 and 2014 amounting to seven percent. Despite the improvement in oil prices compared tolast year, Ahmed guessed that «ranges barrel price between $ 50 and $ 60 over the next five years», so advised «Gulf States to accelerate the implementation of structural to diversify their economies reforms, and strengthening the role of the private sector and create jobs quickly.» He said: «expected to enter more than 2.2 million Arabs of the labor market by 2020, amillion citizens of them will find work». Ahmed stressed that the «workers in the oil – exporting countries remittances to the Levant fell 15 percent during the current year, due to falling oil prices, which impacted negatively on the region , which was forced to lay off workers, especially in the oil petrochemical sectors, banks economies». The newspaper “Aaszewstaa” touched upon the process of liberalization of Mosul; noting that the Iraqis declare that the US alliance lends itself to the terrorists to leave the city to Syria. Started in Iraq Liberation of Mosul “Daesh process. The spokesman said” the popular crowd, “Karim Nouri al regulation that are fleeing the city and heading to Syria, without the Western alliance led by the United States draw any air strikes them. In an interview with “Aaszewstaa” said the Foreign Affairs Committee in the Iraqi Parliament member Iqbal Almave The American alliance is not doing enough in the fight against “Daesh.” In addition, indirectly confirmed that militants fleeing from Mosul to Syria are not exposed to any strikes. And the time required for the Liberation of the city, says Iqbal Almave that there are different assessments on this subject, where some of the process is expected to take 30-40 days. This is based on the belief that the Iraqi forces were able to cut off supplies to militants trapped in the city. In addition, there is within the city by representatives of the special services, and those who lie in their mission to provide Iraqi forces with information Expeditionary necessary. Forces Command also receive important information from residents of the city. And, of course, “gunmen escaped much of the city on their way to Syria. There is a pessimistic view that the liberation of the city process may continue until the end of December / December next. It is noteworthy that the preparations for the Liberation of Mosul, controlled by “Daesh” Since June 2014, began after Iraqi forces managed to free the city of Fallujah last June, after enable in August / August last Edit Qayyarah south of Mosul, the nearby military airport . It should be noted that many news spread before the start of the process of liberalization of Mosul a few days for the gunmen to leave the city and their leaders under a US-Saudi agreement with them, and they were heading to Syria to carry out an attack on the towns of Deir al-Zour and Palmyra. The news was confirmed for “Aaszewstaa” director of the Iraqi Center for Strategic and Security Studies Moataz Mohi Abdul Hamid. It is believed Moataz Mohi Abdul Hamid health news to leave the city of Mosul, insurgents and their attitude towards the Syrian town of Abu Kamal, near the Iraqi border, and from there to Raqqa and Deir al-Zour and Palmyra.It should also be noted the double game that the United States exercised in this case. They are supported by the Iraqi forces in Mosul, the process of liberalization, on the other hand does not show any mention of Hamas in Aleppo. Regardless of the number of political motives and behavior of Washington, this can be explained by the presence of military cooperation between Washington and Baghdad agreement allows it to strike at the terrorists, while it is not between Damascus similar agreement. Abdul Hamid pointed out that Iraq will face other problems after the liberation of Mosul, gunmen “Daesh.” Among these problems, escalating tensions between the central government and the leadership of the Kurdistan region around Kirkuk disputed, after the elimination of the common enemy, where “peshmerga” forces seized control of the city after the emergence of “Daesh.” That is, subordination of Kirkuk problem will go again on the table.